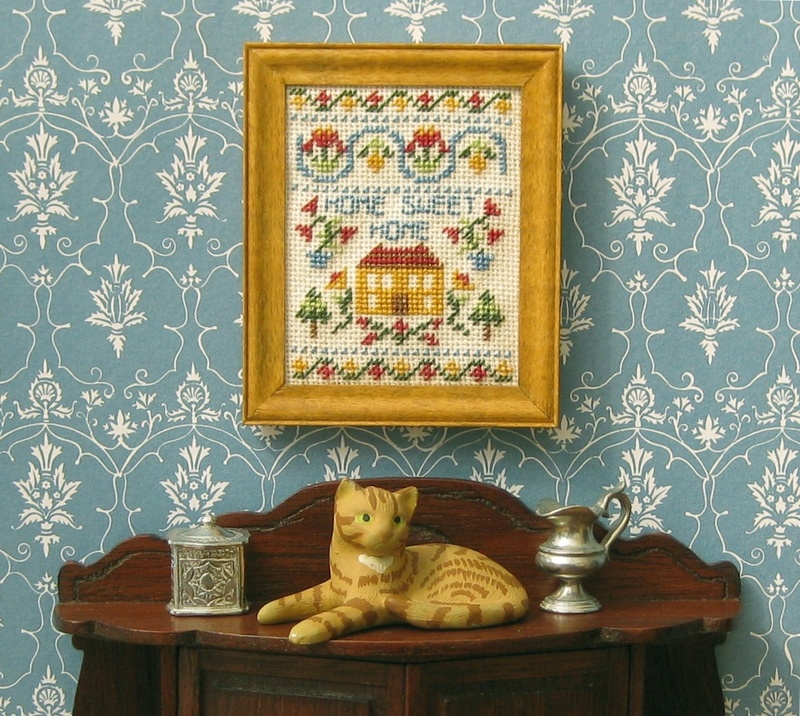 This is the second to last panel that I need to stitch in order to complete the Home Sweet Home workbox, designed by Carolyn Pearce. 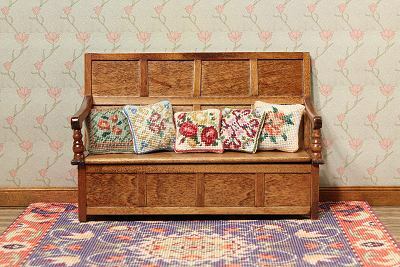 I must admit, I had been putting off doing this side and the one with the pea pods on, as they both have these applique windows on them. 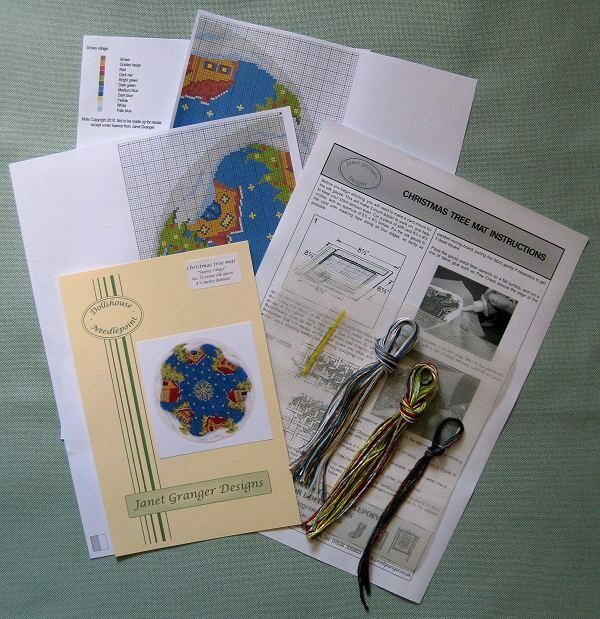 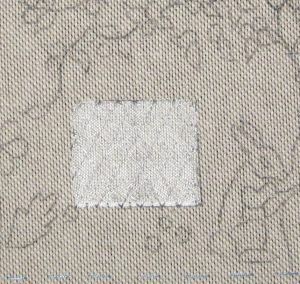 I have read the instructions over and over, but don’t really like the method suggested in Carolyn’s book (using a cloud-filling stitch to make the leaded lights on the windows). 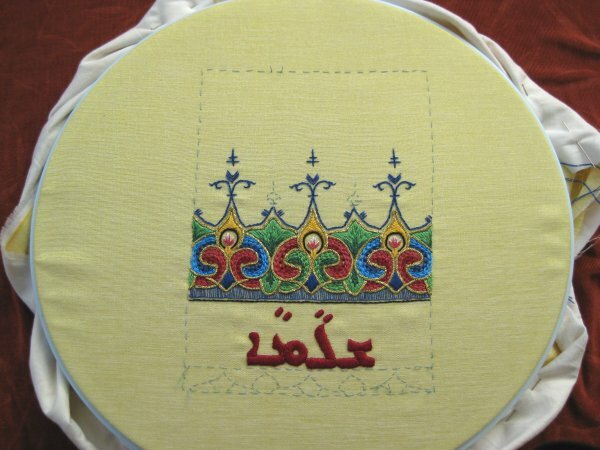 So, in the end, I decided to make my own version! 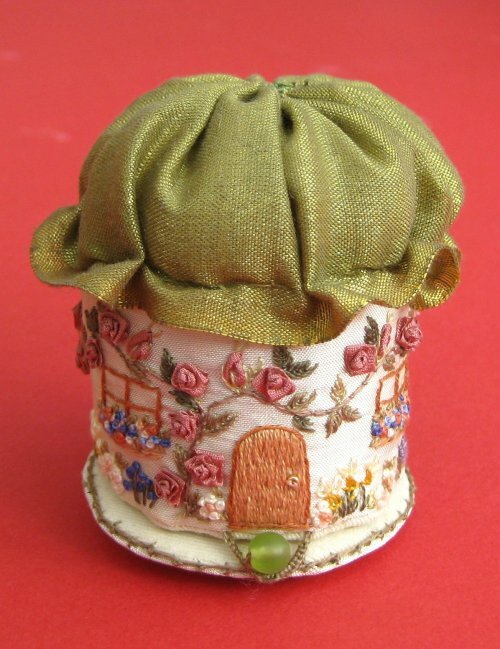 I cut a piece of organza ribbon to the exact size of the window, and tacked it down with tiny stitches around the edge (not using a kind of Bondaweb, as Carolyn had suggested, as I didn’t have any). 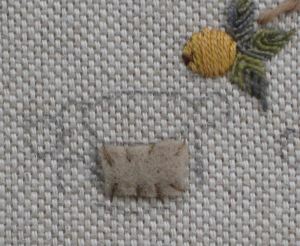 Then I laid pale grey stranded cotton in a diamond pattern over the organza, only attaching it around the edges. 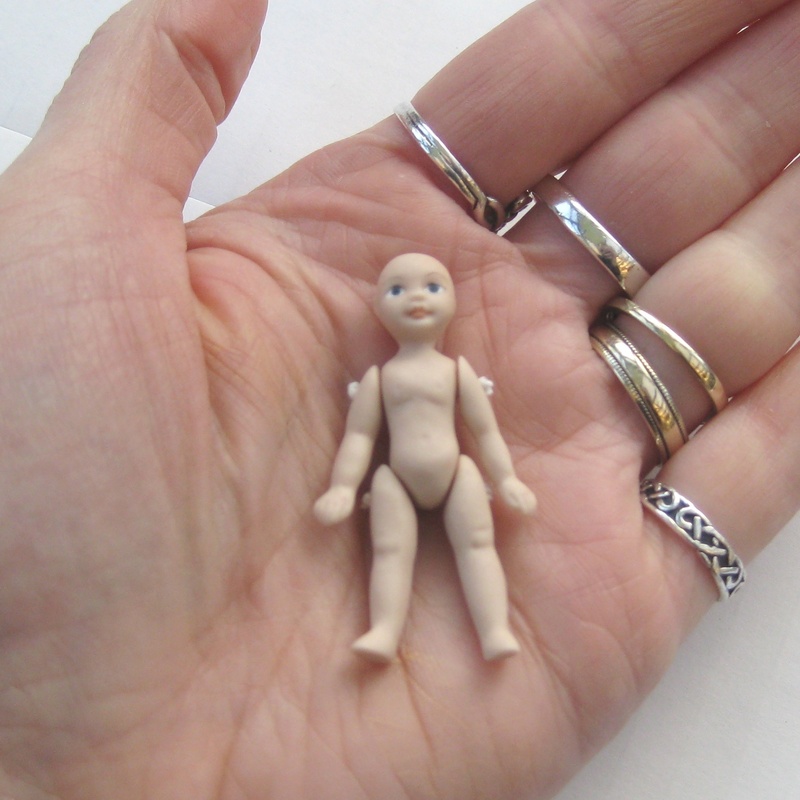 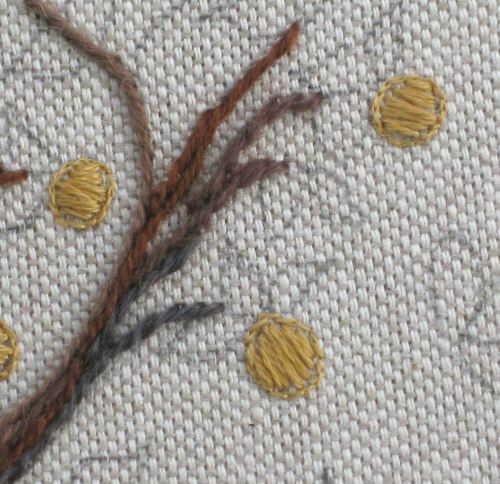 Where the strands crossed over each other, I tacked them down with a tiny stitch in a darker shade of grey. 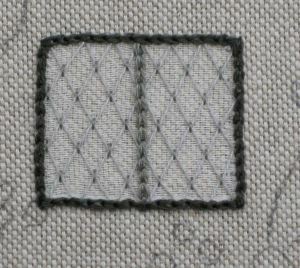 Then, to divide the large panes of the window, I stitched rows of chain stitch in two strands of the darker grey. 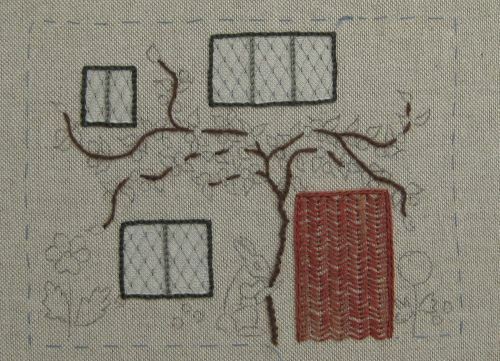 Finally, I surrounded the whole window with a very dark grey outline of Chain stitch. 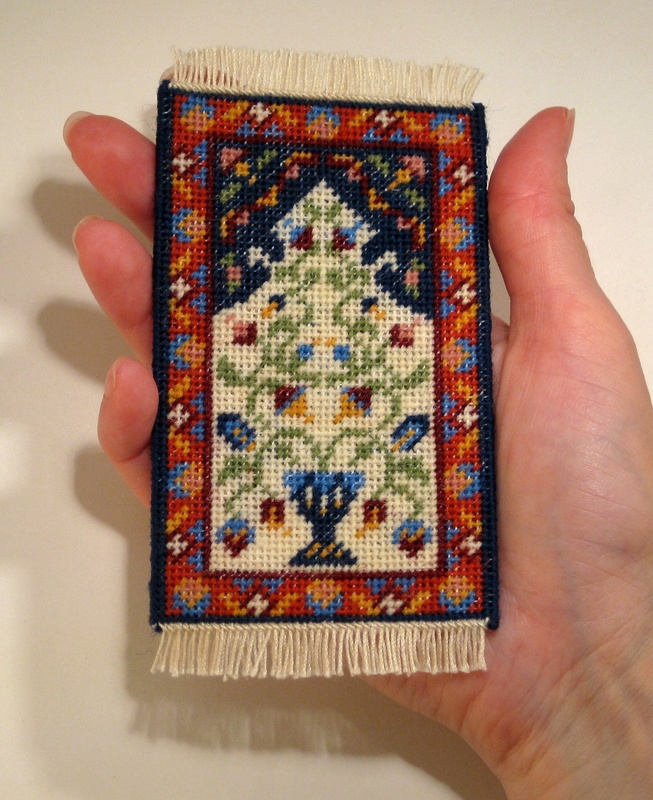 The door, too, I stitched slightly differently from Carolyn’s instructions. 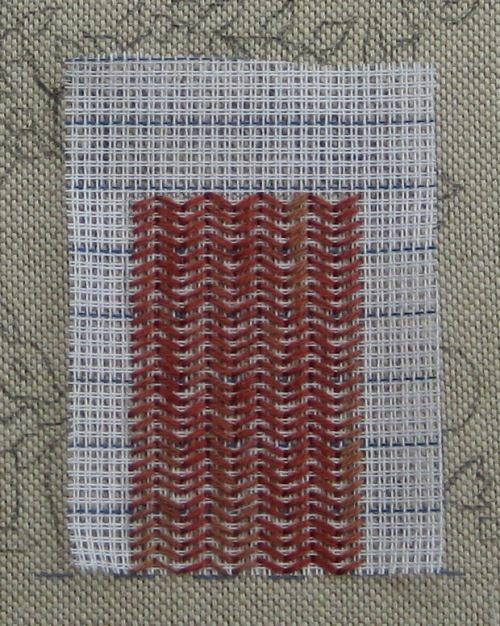 She suggested Cretan stitch variation, worked over waste canvas. 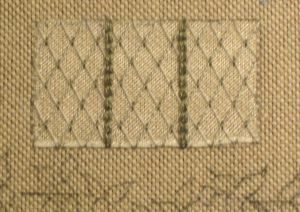 I had some 14 count waste canvas, but couldn’t be bothered with such a fiddly stitch, so I worked rows of tent stitch over two horizontal and one vertical threads of the canvas. 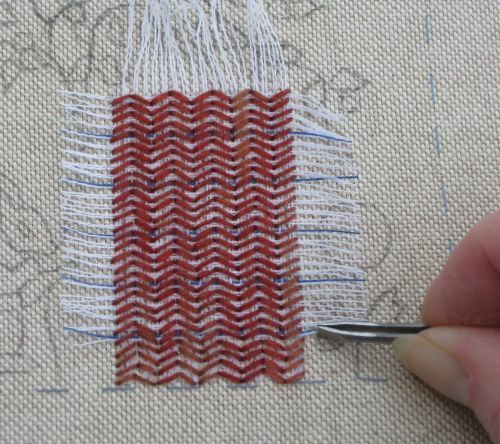 When it was all done, I dampened the canvas (being careful to not get the surrounding pencil lines of the rest of the design wet), and then pulled out the canvas threads with tweezers, leaving the embroidered chevron pattern behind. 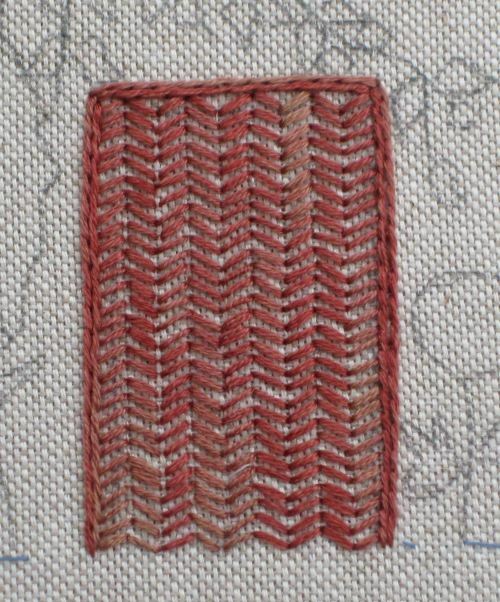 To finish the doorway, I worked two rows of Stem stitch in the same variegated thread. 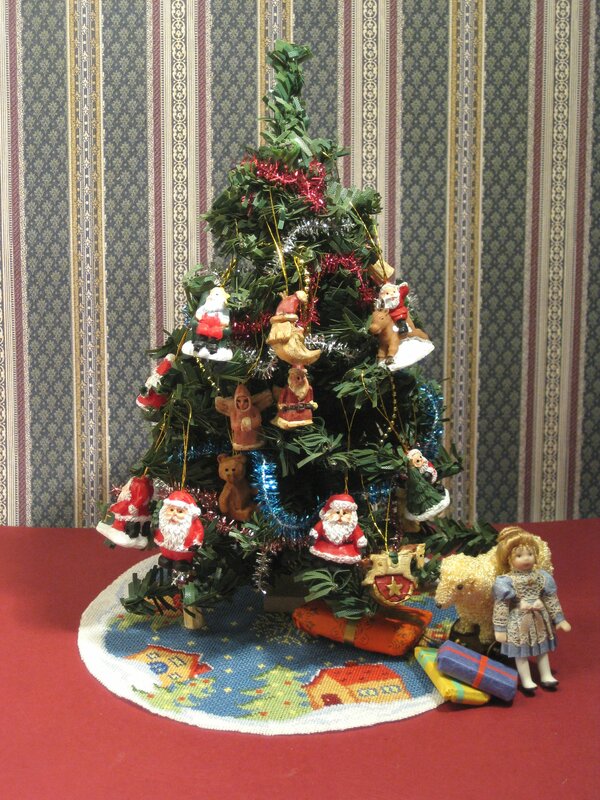 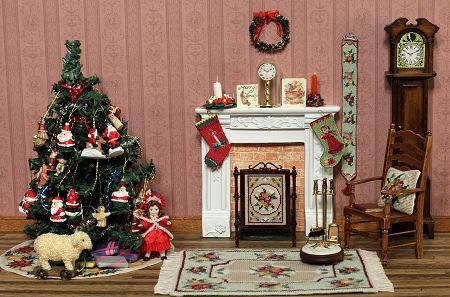 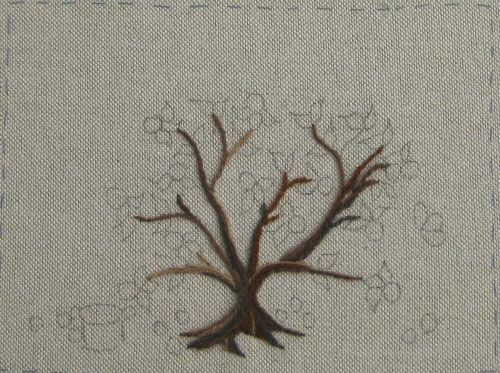 The climbing rose tree has Stem stitch branches, and Coral stitch trunk. 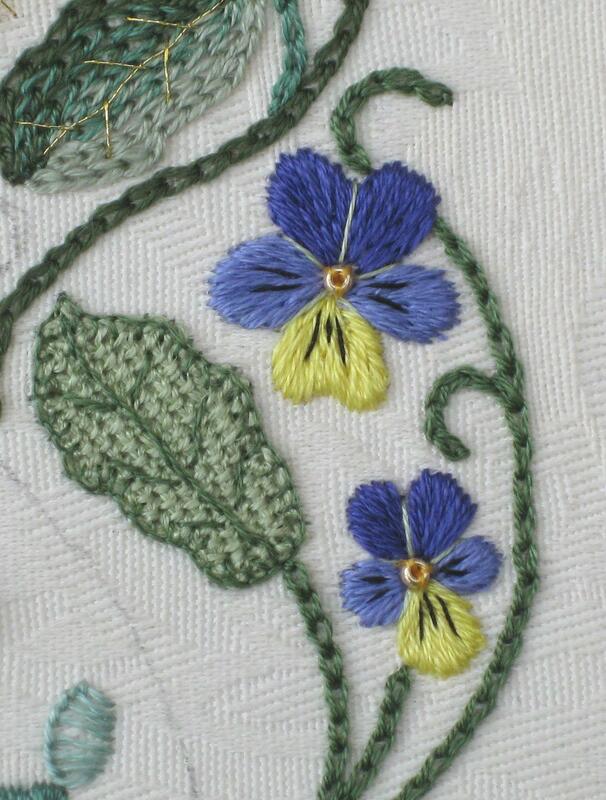 I used two skeins of variegated fine wool for the leaves, but due to the variegations, it looks like I used many more colours than that – I am really pleased with how this part turned out! 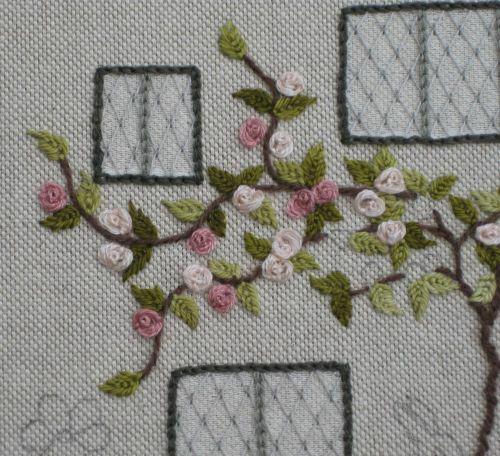 The roses are made by stitching little Rosette stitches among the leaves, in two shades of pink. 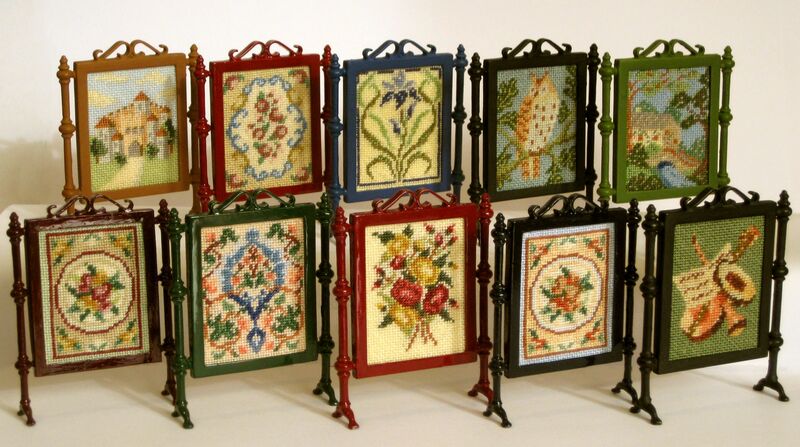 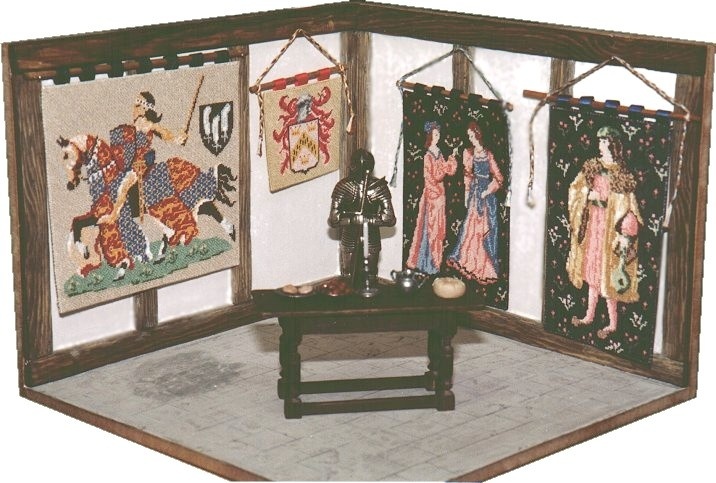 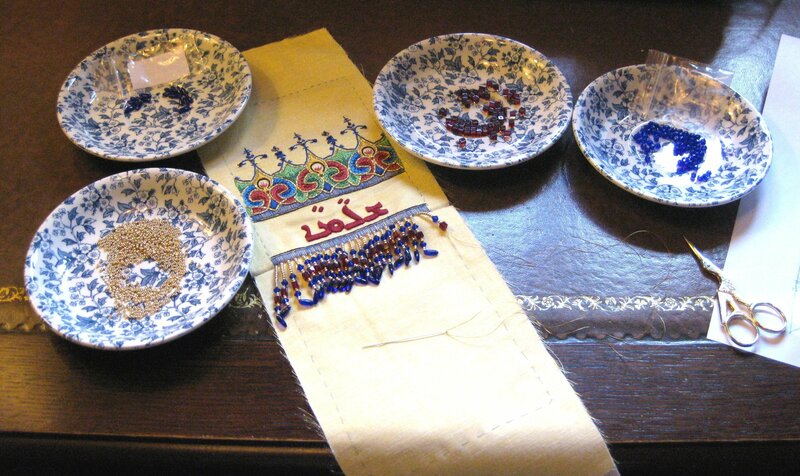 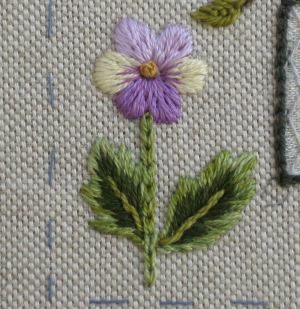 Along the base of the wall, on the left hand side, is a large pansy, stitched mainly in Long and short stitch, with a four-wrap French knot centre. 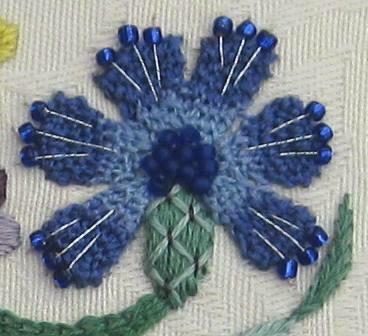 On the right hand side is a cornflower. 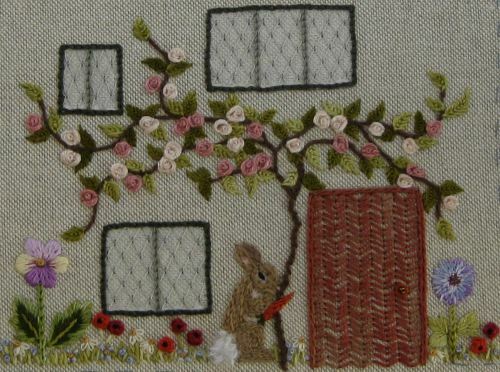 At the base of the climbing rose is this dear little rabbit. 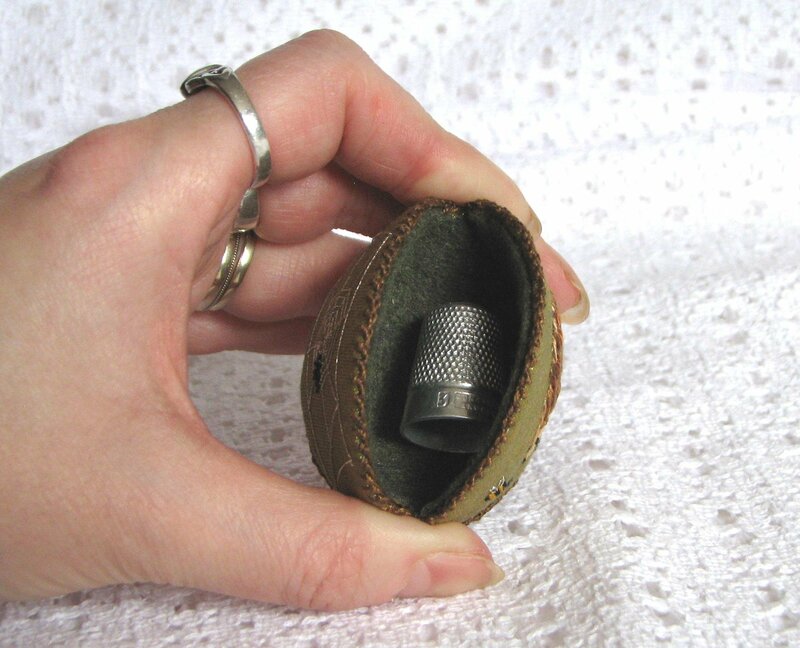 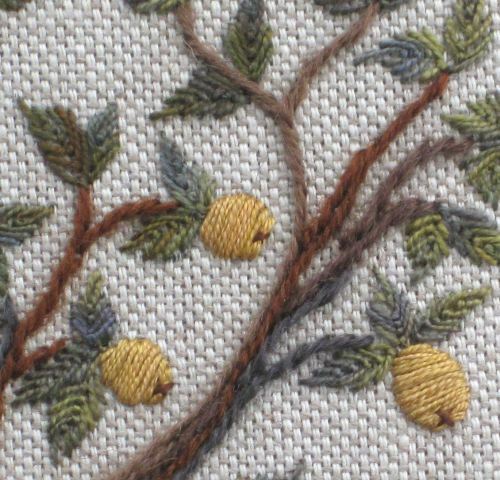 He’s stitched in one strand of Appleton’s crewel wool for the most part, in rows of Stem stitch, and some Long and short stitch. 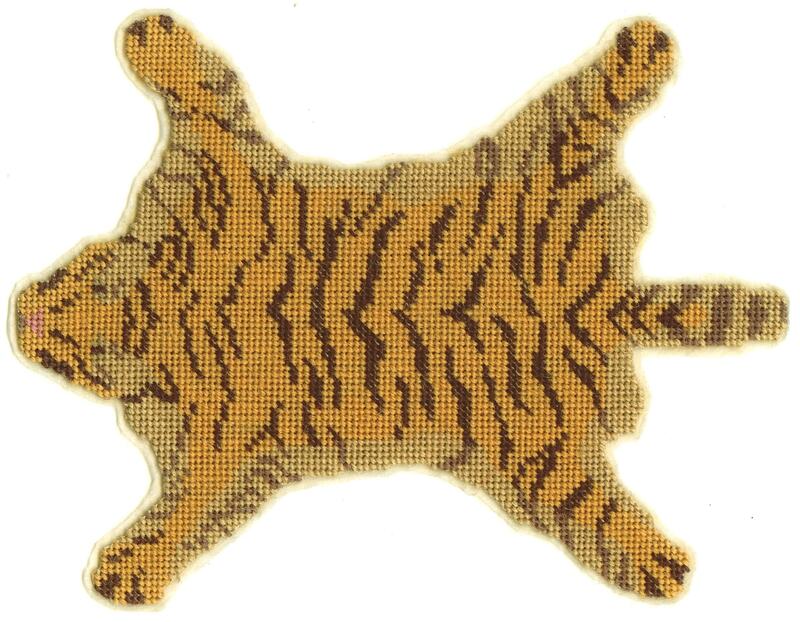 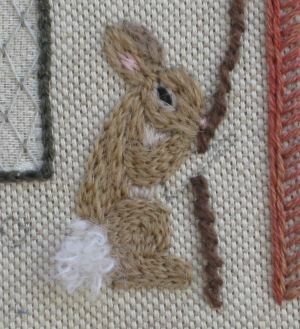 His tail is Turkey stitch (uncut), using Rainbow Wisper thread. 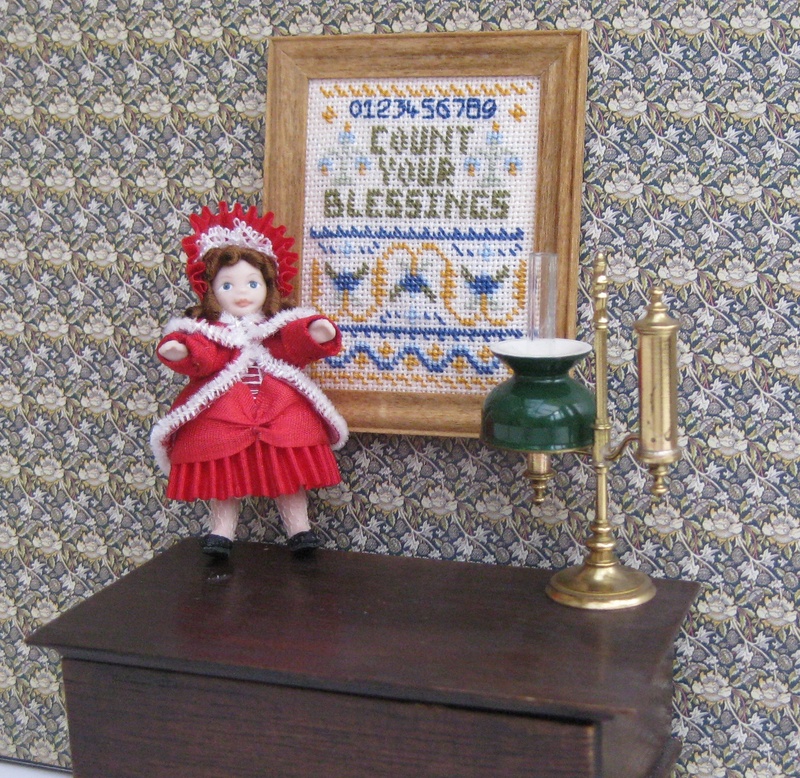 This picture was taken before I’d stitched him holding a carrot. 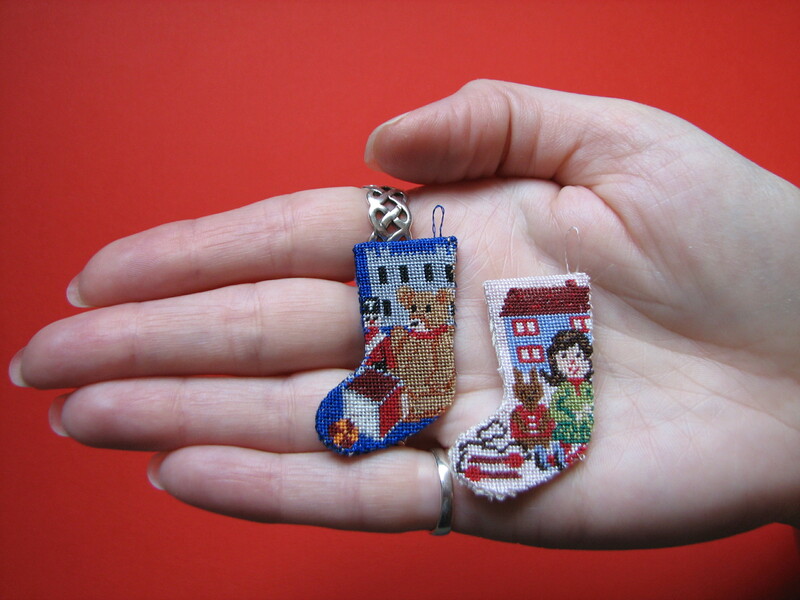 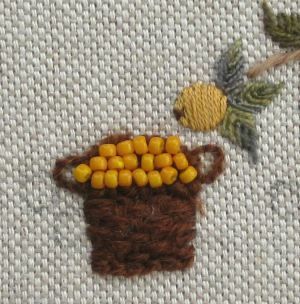 In Carolyn’s book, she uses a charm for the carrot, but I don’t like charms much, so I embroidered the carrot instead. 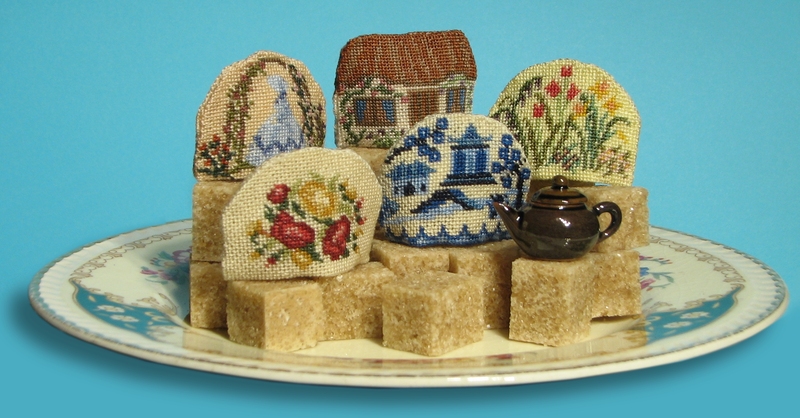 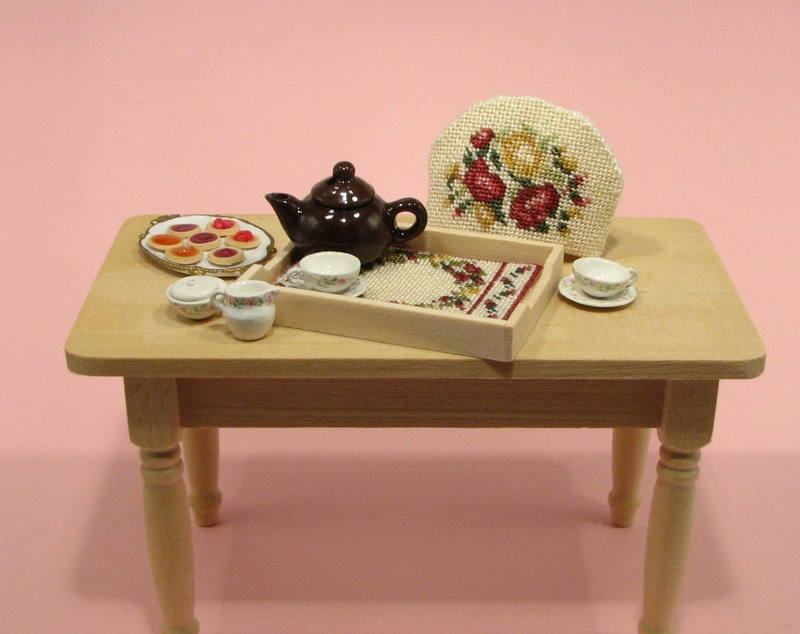 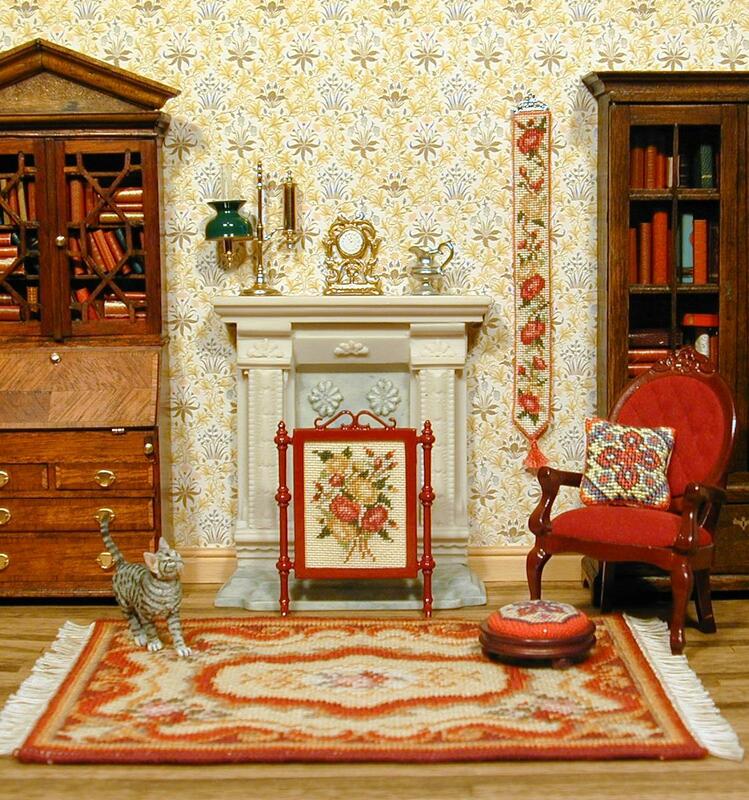 I am currently stitching the ‘Strawberry side’ of the Home Sweet Home workbox, designed by Carolyn Pearce. 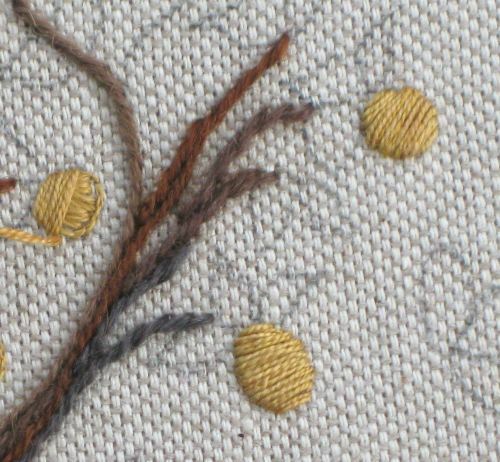 I stitched the main stem first, in Knotted pearl stitch, using Perle 12 thread, which makes a nice strong knot for each stitch. 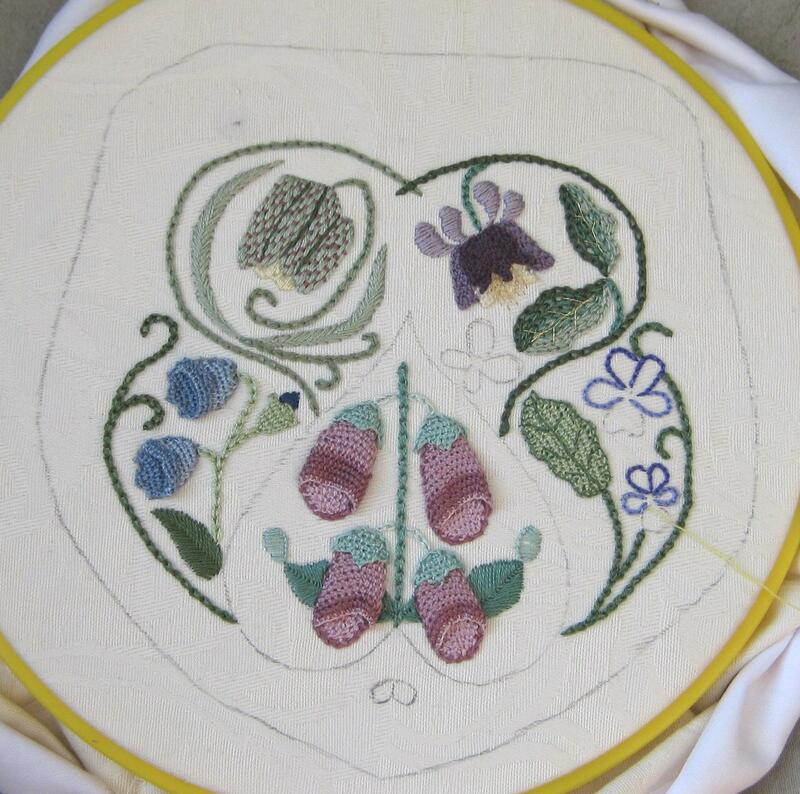 I deliberately spaced out the stitches as I worked from top to bottom, so that the stem gets wider lower down. 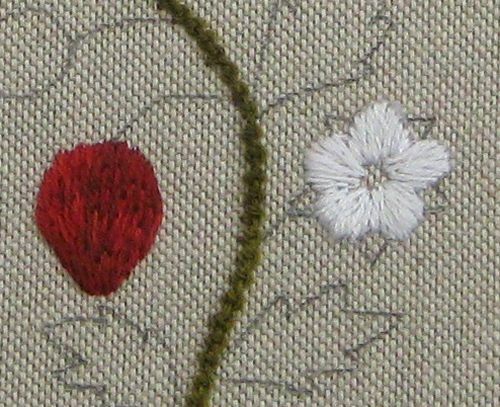 Next, to embroider the ripe strawberries, I padded the shapes by first working split backstitch around the outlines, then working two layers of Satin stitch across each shape, inside the backstitched outlines (one layer at right angles to the other). 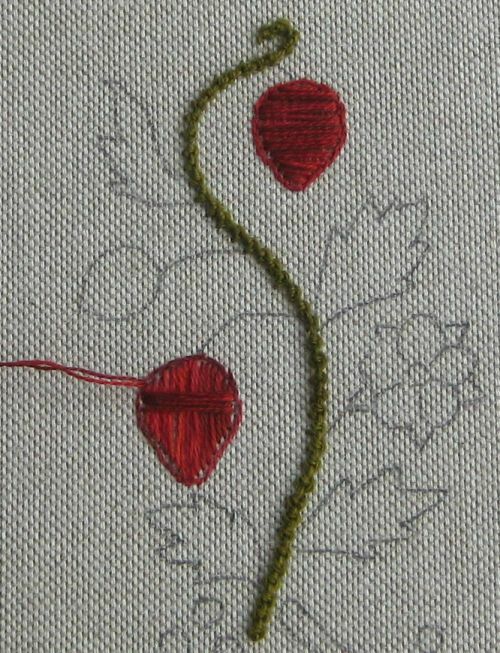 Then, starting from the top of the strawberry, I worked Long and short stitch using a variegated silk thread, covering the backstitched outline as I went. 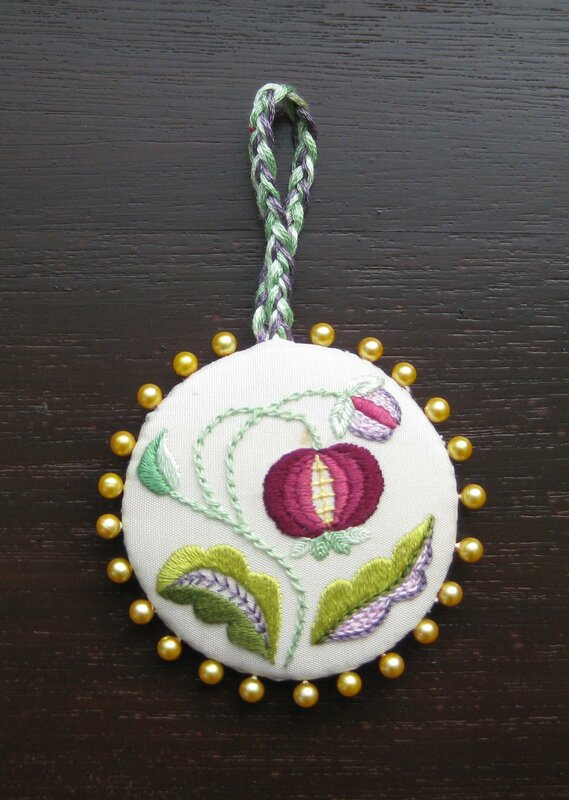 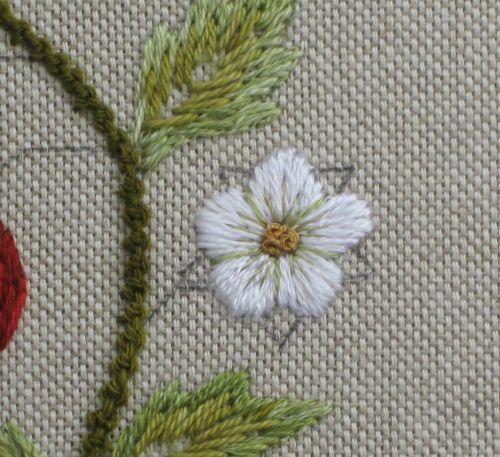 I also started to stitch the white strawberry flower in the same way. 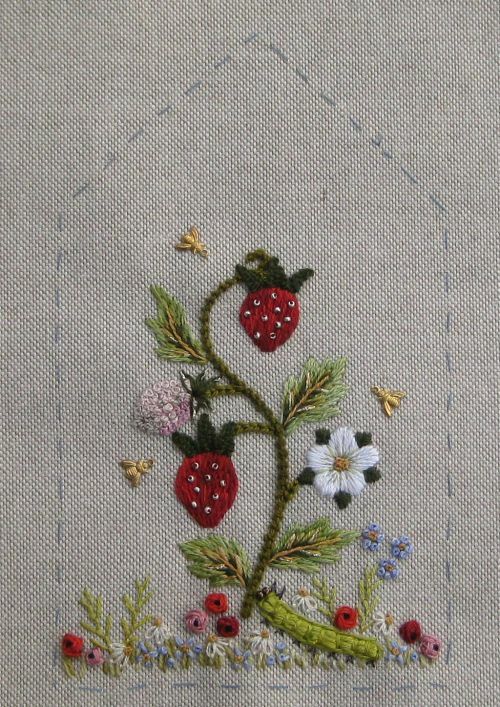 The unripe strawberry on the left hand side was stitched in three shades of very pale pink, in French knots using two wraps each time. 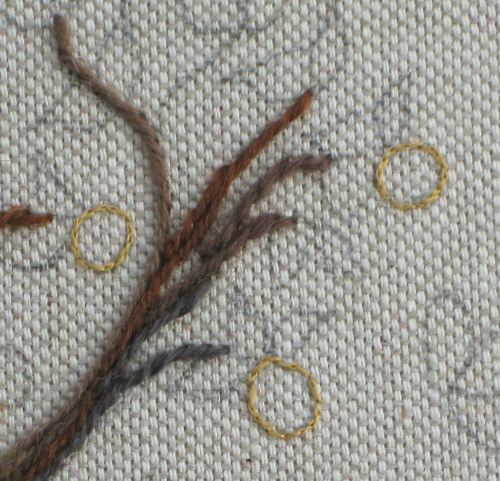 I found it easier to work an outer ring of knots first, to define the shape, and then fill it in – otherwise, the shape has a tendency to just keep getting bigger! 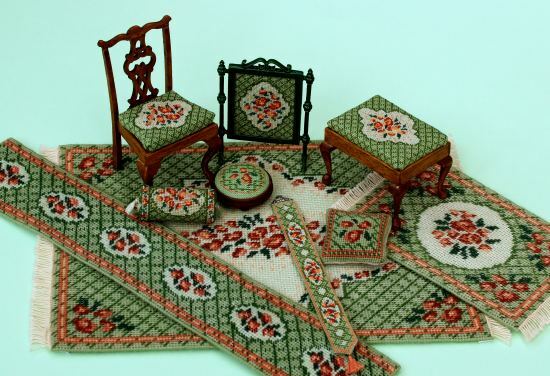 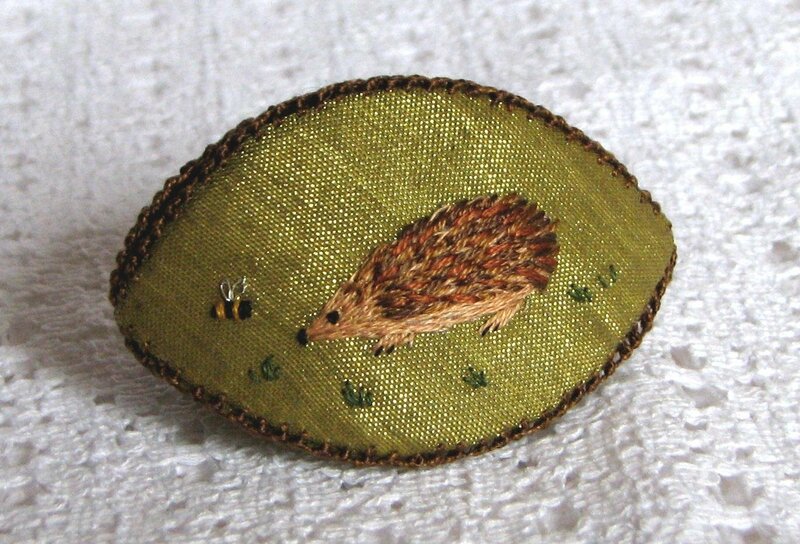 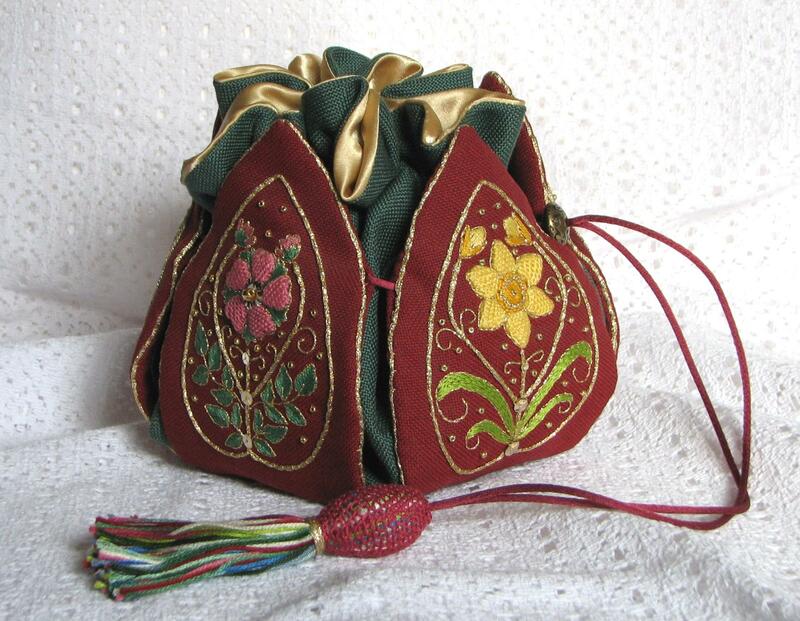 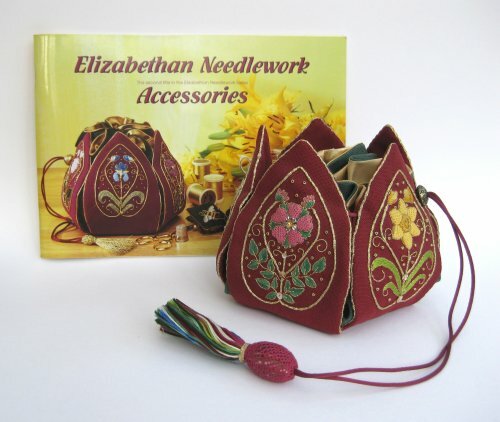 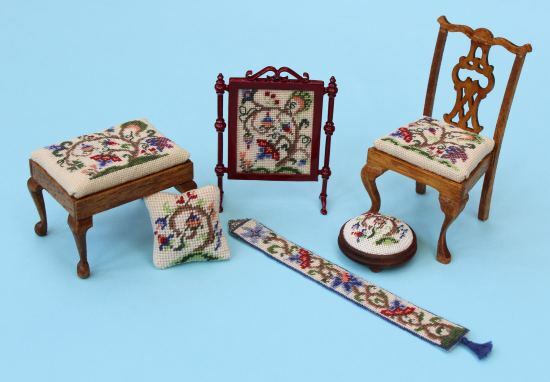 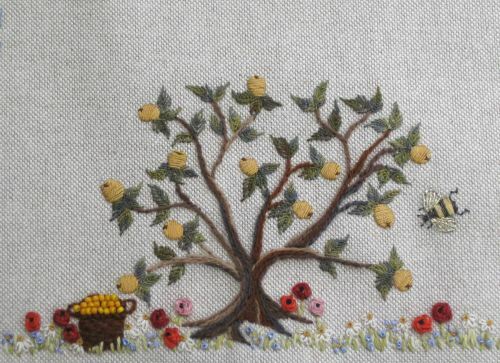 The leaves are stitched in three shades of green, in the same way as the strawberries and flower, but without the padding first – backstitched outline, then Long and short stitch filling, from the outside in. 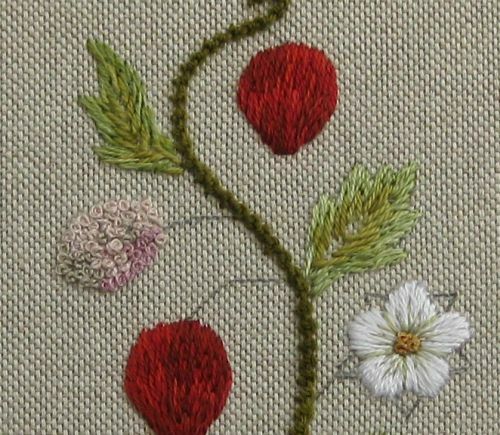 The highlights on the strawberry flower are made using pale green silk – straight stitches between the petals to define them, then several fanned out straight stitches from the centre outwards on each petal itself. 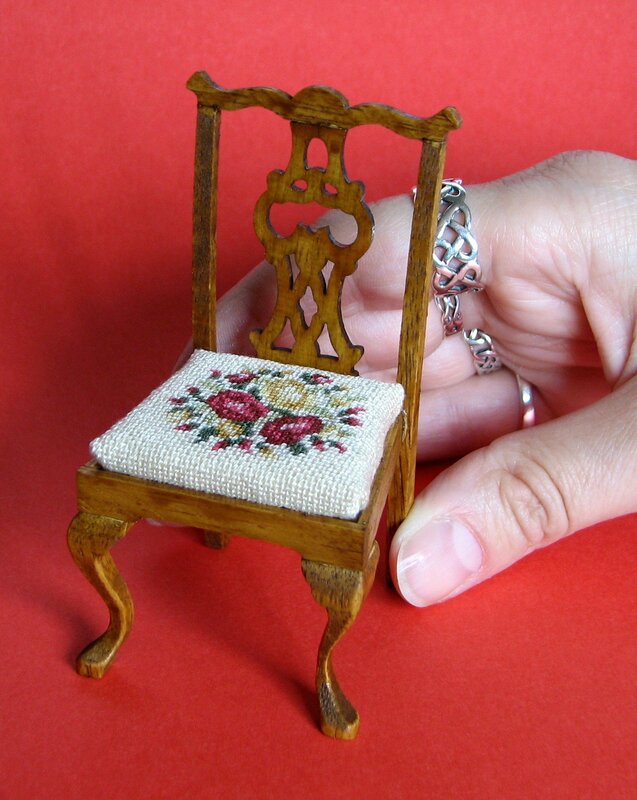 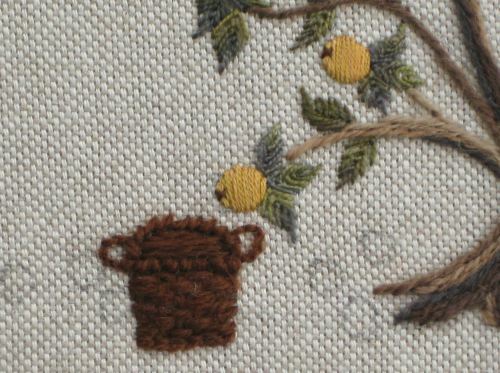 Three French knots in yellow fill the centre. 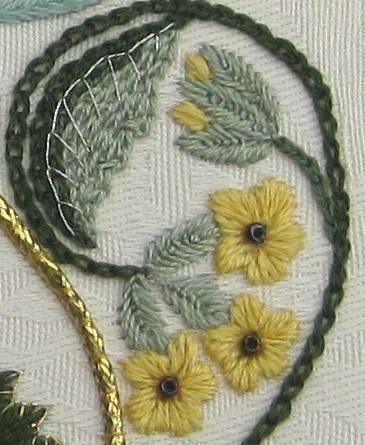 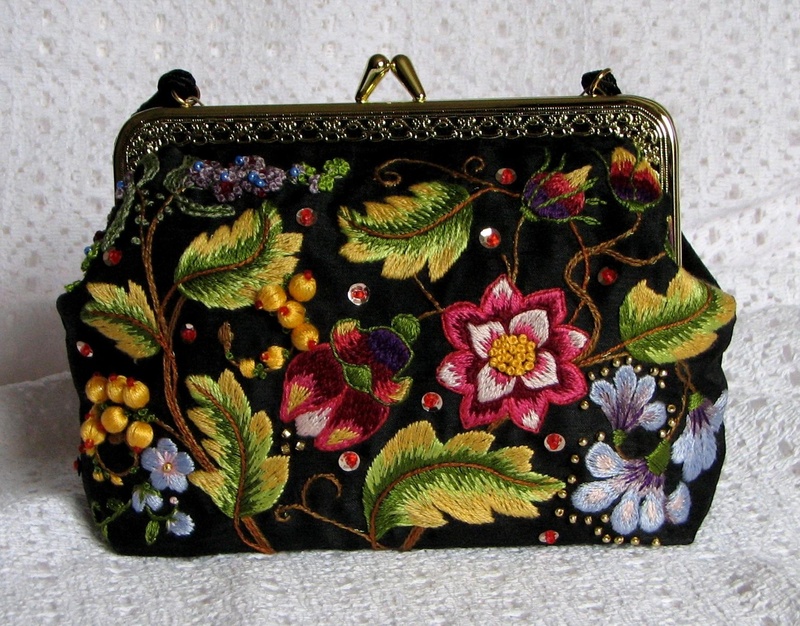 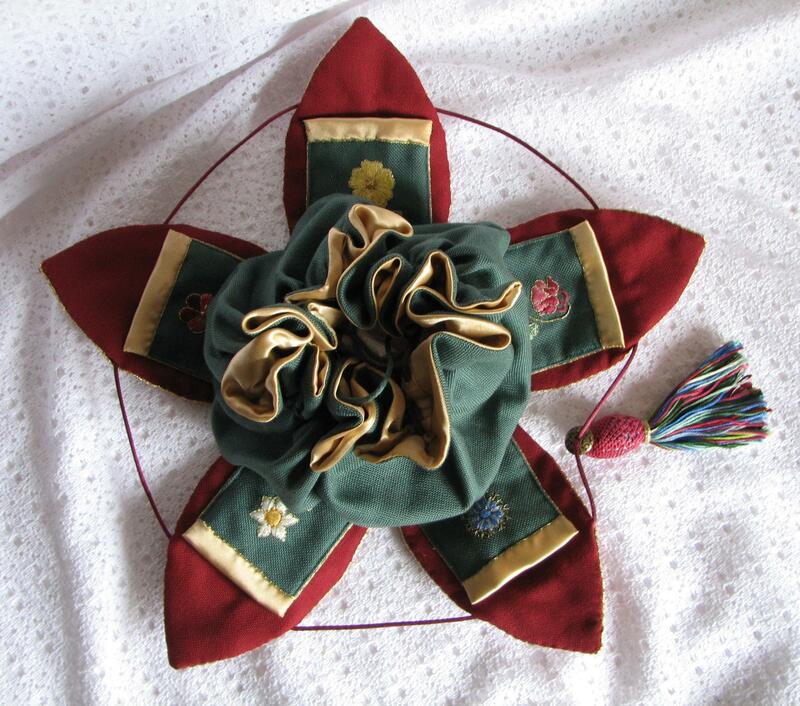 The leaves behind the flower are worked in Leaf stitch, in very dark green Anchor stranded cotton. 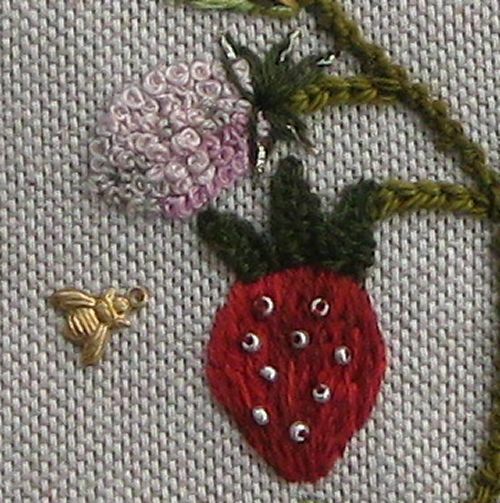 The sepals for the ripe strawberries are worked in Picot stitch, and for the unripe strawberry they are Lazy daisy stitches in dark green, with a gold highlight added last. 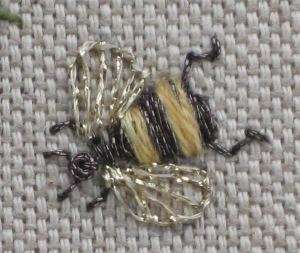 The little bee charm is from a packet that I bought on Ebay several years ago – very small, dainty ones, that were very cheap I seem to remember, but I can’t remember exactly who I bought them from! 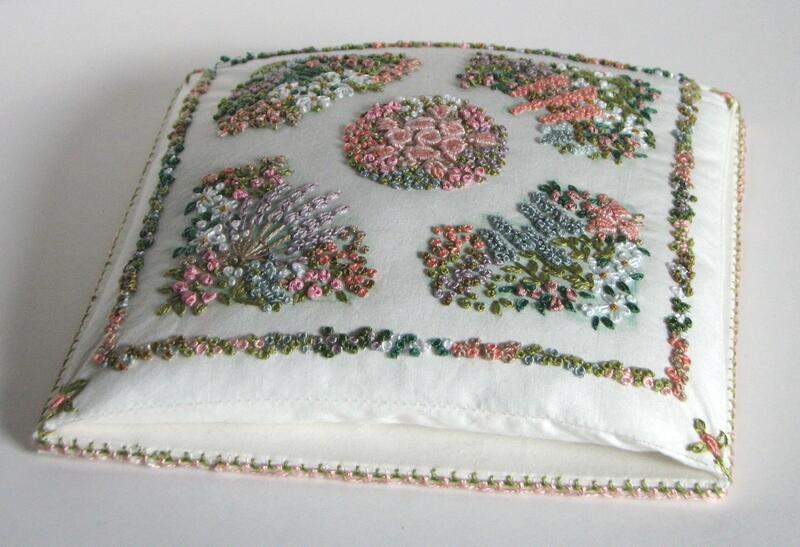 The meadow flowers along the bottom edge are similar to the ones on the ‘smalls’. 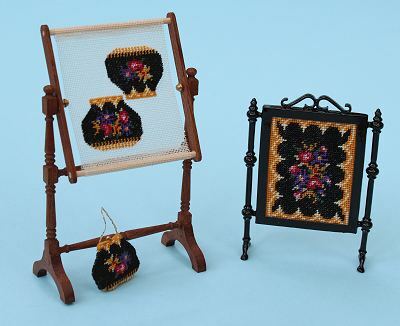 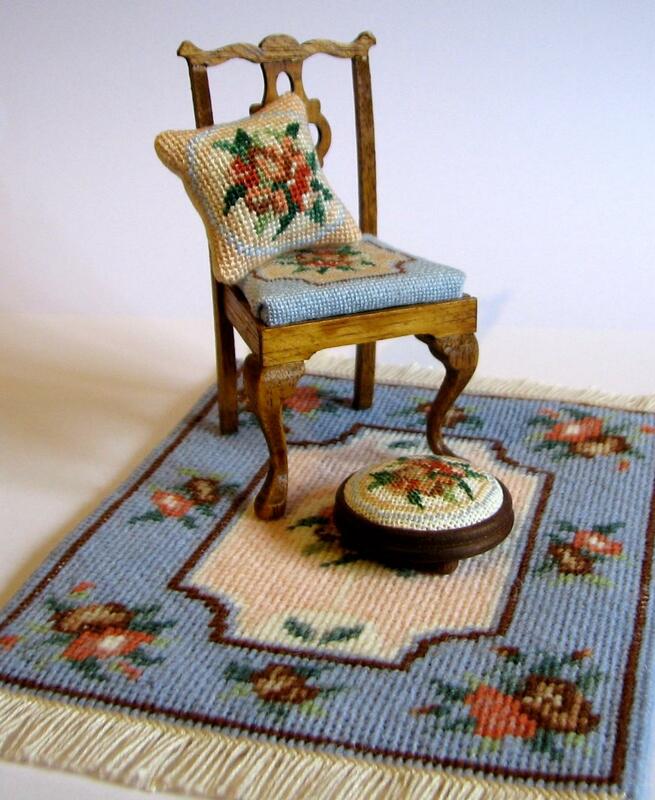 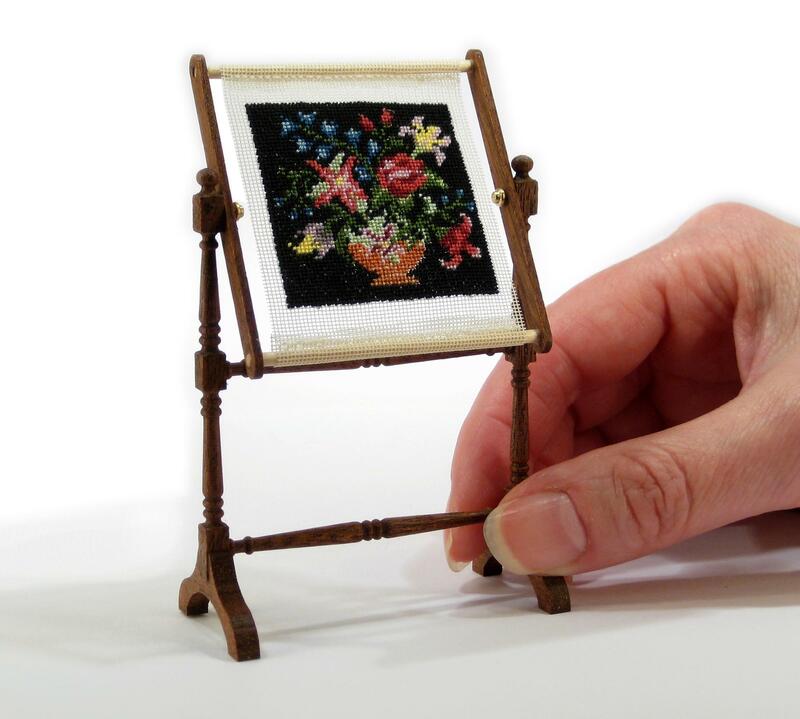 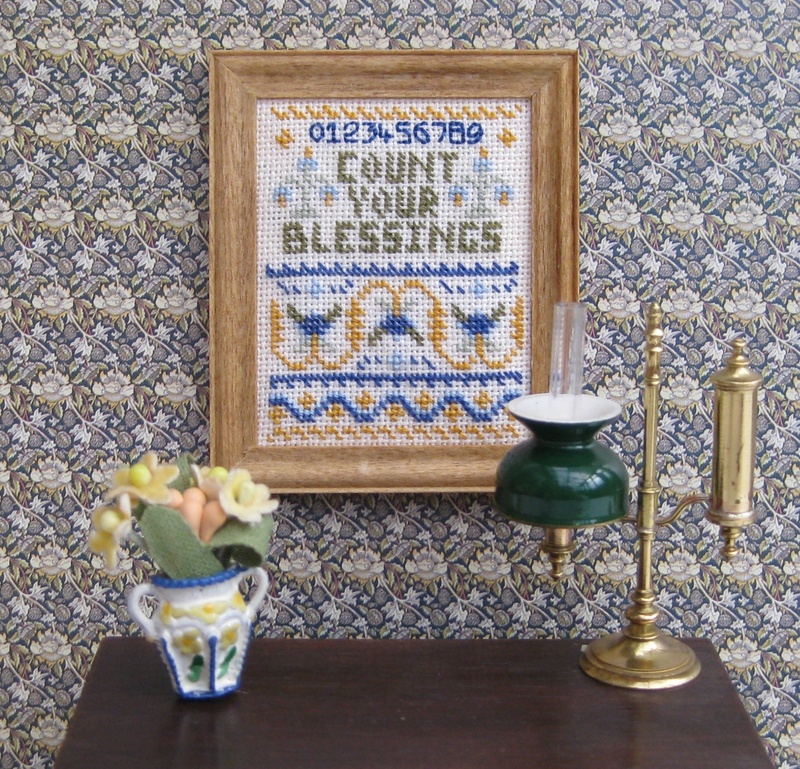 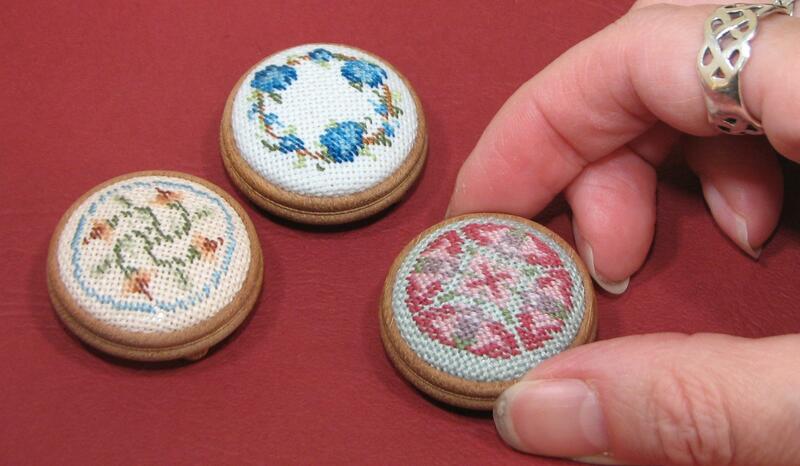 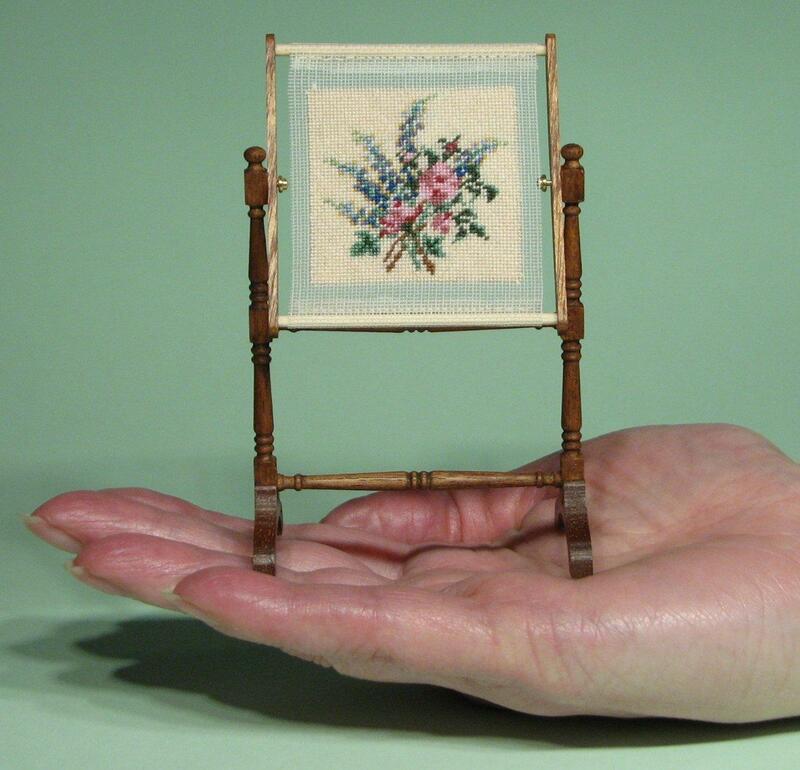 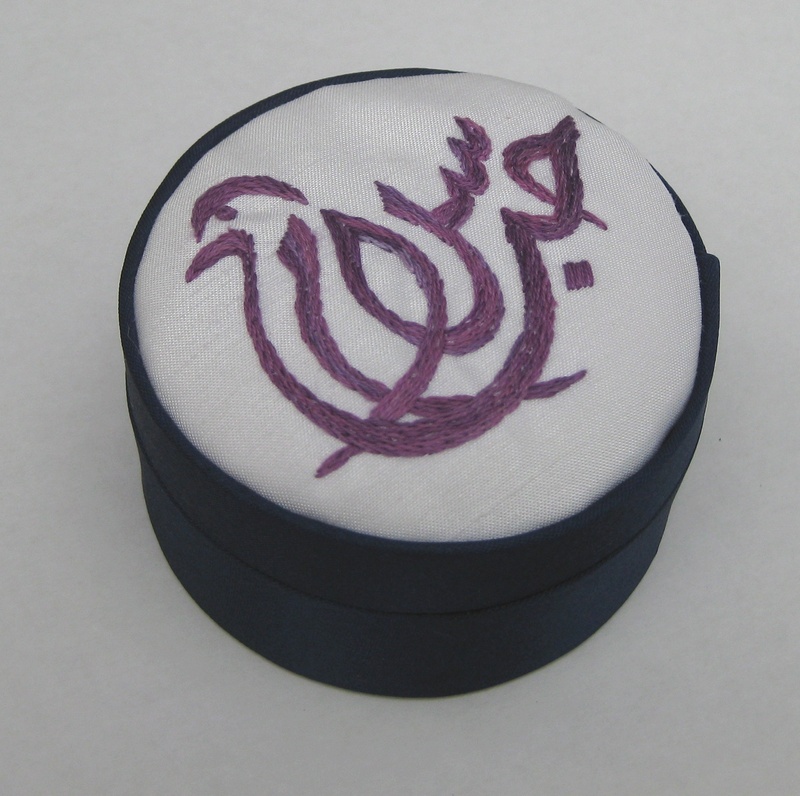 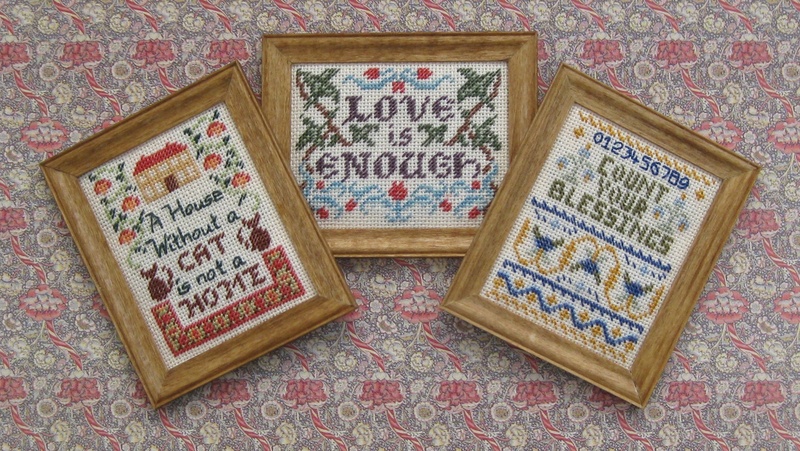 The anemones are Raised cross stitches with a black French knot in the centre. 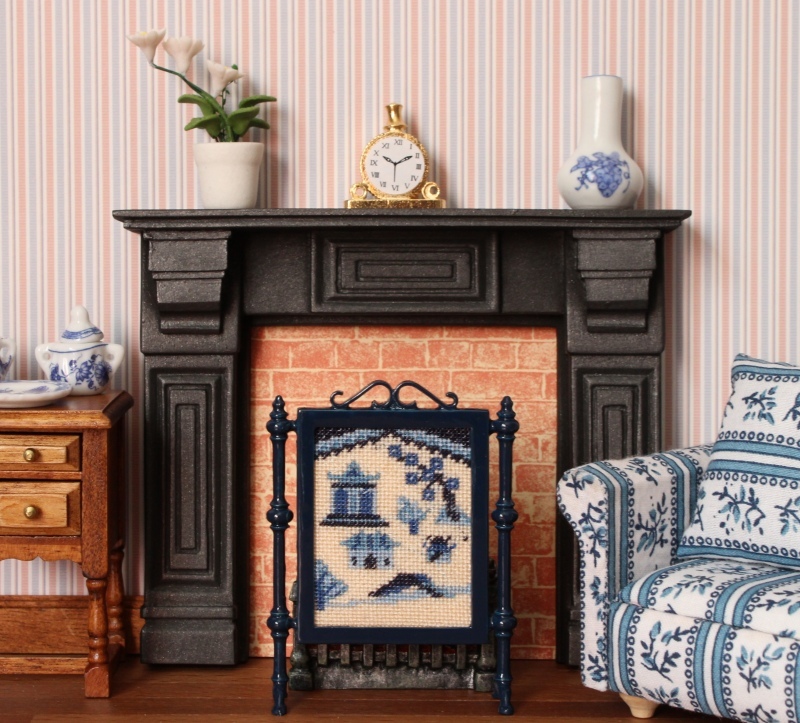 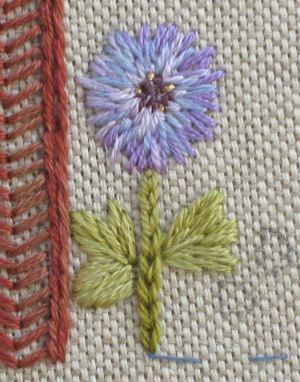 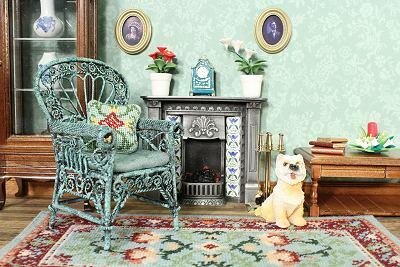 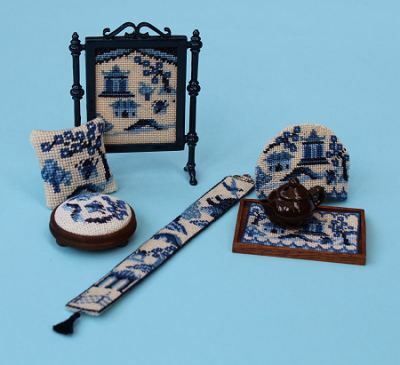 The daisies are three individual Lazy daisy stitches, with a gold French knot highlight, and the forget-me-nots are Granitos stitches in variegated blue silk with a French knot centre. 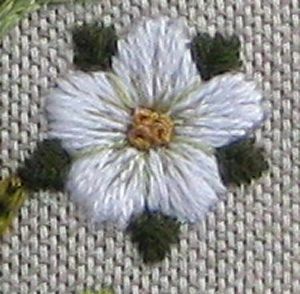 The three blue flowers above the caterpillar are supposed to be blue feature buttons, according to Carolyn Pearce’s instructions in her book, but I couldn’t find those to buy, so I improvised. 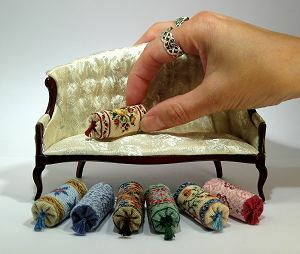 The caterpillar itself is made from three thick threads of variegated silk, couched down with one strand of the same thread, and then Stem stitch worked around the outer edge. 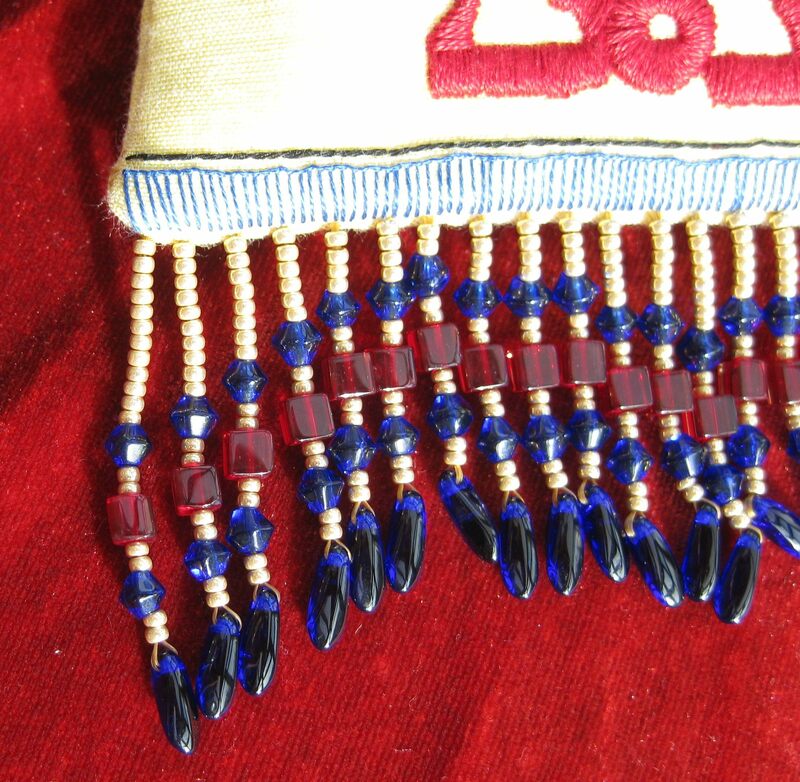 The eyes are bronze colour seed beads, and the legs and antennae are gunmetal metallic thread.